American Wolf: Imagine: A "1971" Beatles Album. Imagine: A "1971" Beatles Album. To paraphrase the great philosopher Eli Cash: "Well, everyone knows the Beatles broke up in 1970. What this post presupposes is...maybe they didn't." It goes without saying that the Beatles brought out something truly remarkable in one another; despite the flashes of greatness from their solo works, these were only flashes. Because let's face it, even the best Beatles solo works are only about one-quarter as good as the worst Beatles music. This is not to belittle the efforts of Lennon, McCartney, Harrison, & Starr per se; there is no reason to believe that anyone could have created music that could make anything more than fleeting grasps at the greatness that was The Beatles. However, it wasn't until recently that I began stacking their solo music up against each other. Although I knew that they each did some classic work in the early '70s, it wasn't until now that I recognized just how closely this work lined up. Between February 1970 & September 1971, the solo Beatles released the bulk of what was to become their solo legends. John Lennon released his twin masterpieces Plastic Ono Band & Imagine, generally considered the finest of all Beatles solo work (including his own), as well as stand-alone hit singles like "Instant Karma!" & "Power to the People"; Paul McCartney released "Maybe I'm Amazed" as well as his classic Ram album (with his first US #1 hit); George Harrison released his triple-album masterpiece All Things Must Pass & staged his legendary Concert for Bangladesh; even Ringo enjoyed a hit with the finest song he would ever have a hand in writing, the timeless "It Don't Come Easy." Of the music made in this time period, only McCartney would truly top his work when he released Band on the Run in 1973 after a string of uneven solo efforts. Perhaps not coincidentally, McCartney was the only one who made his 1970-1971 music in a virtual "Beatle isolation," collaborating only with his wife Linda. The other Beatles left fingerprints all over each other's efforts. Harrison supplied lead guitar & backing vocals for "Instant Karma!" & appeared on Imagine, while Starr drummed on Plastic Ono Band; Starr played on Harrison's "My Sweet Lord" & joined Harrison as part of his Bangladesh concert; Harrison in turn produced, played on, & co-wrote (some believe ghost-wrote) "It Don't Come Easy." In considering all of this, I began to wonder if there was something to be said for the proximity of this music to the Beatles' final days—that is, what if The Beatles had stuck it out for one more album? What would it sound like? Well, for my money, it would sound pretty damn good. I've spent the last week or so tinkering with what could have been a lost "final" Beatles album from the fall of 1971. It not only stands as a solid collection of otherwise somewhat patchy solo-work, it also serves as a near all-you-need primer of their solo careers. When playing the scenario out though, I had to make some executive decisions. 1. It seems to me that Plastic Ono Band is a standalone solo album—if not the standalone solo album—& to pretend like any of it could have happened without The Beatles being separate from it (Ringo notwithstanding) would defy logic. In my version of these events, I imagine Lennon still recording & releasing it as a solo effort—just as he had with "Give Peace a Chance" in 1969—before adding some material to this "final" Beatles album. 2. Similarly, I saw Harrison's Bangladesh project as a separate entity that would have coexisted alongside this album. The concert is literally its own event, & the hit single it spawned felt more like an appendix to that than its own song that could have been lumped in on an album (in fact, it the single version never appeared as part of a proper Harrison album until a recent reissue of the Bangladesh concert). 3. When in doubt, I went with what sounded closest to the Beatles. 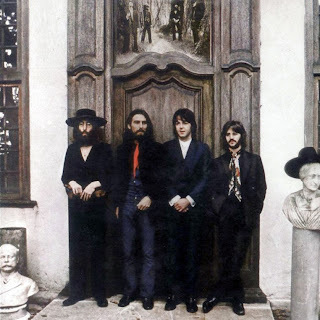 Solid cuts like McCartney's "Too Many People" were left off because of Linda's presence; anything featuring Yoko as a co-vocalist was similarly excluded. A song like "Power to the People" was a hit in its own right, but left off in favor of some Imagine album cuts because they are more approximate to what the Beatles sounded like. To stretch the point, the same went for Starr's 1970 country album. 4. I wanted it to closely mirror the Beatles' albums in terms of "Beatle Influence." In the end, the album contains 1/3 Lennon & 1/3 McCartney (4 songs each), 1/4 Harrison (3 songs), & 1/12 Starr (1 song). Perfect. 5. Finally, I tried to approximate a Beatles running-order. It runs a little over 50 minutes, right on par with later works like Abbey Road & the first disc of "The White Album." I also tried to split things up as they may have been in a Beatles record—hence the George songs are spread out, Lennon songs are up top, etc. Finally, I tried to think in terms of the Beates' own albums & the material here. "Imagine" is one of those songs that simply has to be the lead-song; any other placement feels false. Likewise, "Isn't It A Pity" makes an epic album closer. Because, when it comes down to it, the whole notion of this "1971" album comes down to the sentiment of those two songs: Imagine, & Isn't It a Pity. So there, yer welcome. Go ahead & make yourself a "new" final Beatles album on yer iTunes. & if you need a cover, use the one at the top of this article—taken from the Beatles' final photo shoot at John's house. No title on the cover needed (a la Abbey Road!). But I like to call it: Imagine [A "1971" Beatles Album]. I HAVE A QUESTION FOR ANYONE THAT CAN ANSWER..... I HAVE MANY RECORD ALBUMS IN WHICH I AM LOOKING TO GET THE I GUESS GOING RATE FOR THEM. SO I HAVE SEARCHED AND SEARCHED FOR THE RIGHT PEOPLE TO TALK TO. SO I WAS WONDERING IF YOU COULD PLEASE EMAIL ME BACK AND MAYBE GIVE ME SOME IDEA OF WHAT SIGHTS I COULD MAYBE CHECK OUT AND DO SOME RESEARCH ON ANY OF THE RECORDS THAT I HAVE? I CAN BE REACHED AT KORYBRANDI01@GMAIL.COM. I WOULD GREATLY APPRECIATE IT AND THANKS FOR YOUR TIME.